A day for memories of long ago. I remember this tree, from 3 decades ago, still at the same spot, still enveloping every passing thing in its protective shade. I also remember the summers spent here — this small town, where the neighbours were two rice farmers, an Indian Bank cashier and a cooking oil merchant. I remember that one hot May day when I was let to go on my own and watch trains. I remember my mother giving me an Enid Blyton and 1 rupee. “Should be enough for a bajji and buttermilk”. So it was on that day, full of happiness, I sat under this tree and watched the trains come and go and read. The 1 rupee bajji and buttermilk nibbled, saved, sipped. At seven, when the big passenger to Mayavaram left, I hitched a ride on the station master’s bicycle, it’s weak lamp not quite in sync with the pedal. 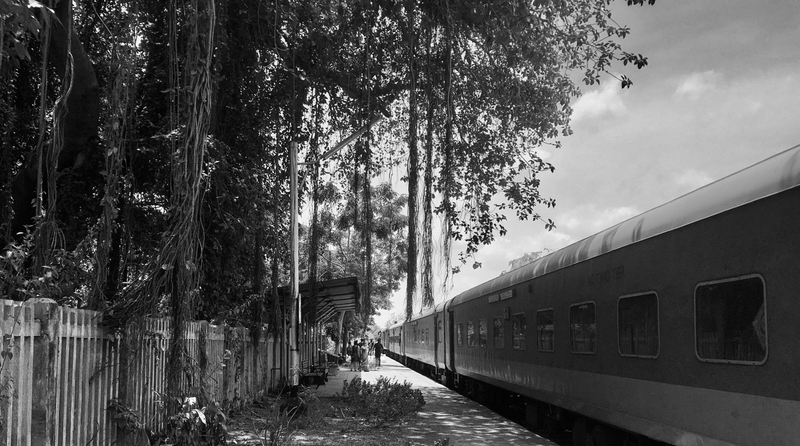 Behind me was the tree and the sloped tile roof of Aduthurai station.